For the Dave Haynie quote already! Seriously fine stuff that set my Data Kalsong on fire! This is just so very pleasing! 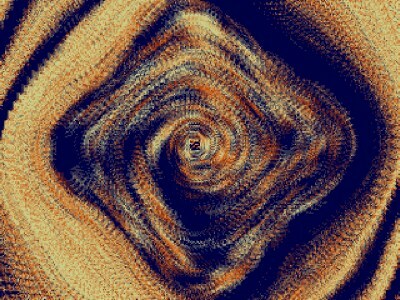 Massive chaos zoomer effect! Must be the most versatile variant of this kind of effect so far and in 1K (with sound). I wonder what Larousse would say to this application of his theorem were he with us today! Very pleasant 1K! And even with good sound! a massive 1kb punch in the face. I'll have the same beer Dave Haynie had! Super awesome effect and sound. Chaoszoomer++ is worth a thumb alone. Would give another thumb for size. Would give another thumb for music in this size with this effect already crammed in. Would give another thumb for what Dave Haynie said! rulez added on the 2017-02-15 20:47:09 by ɧ4ɾɗվ. Hypnotizing effect and a real nice tune. Sorry that I didn't bring a fight this time, I had nothing prepared. I hope I get inspired again any year now. :'( This is my problem to solve and is really quite irrelevant. But if someone has a vaccine for my allergy I will line up for the shot. The #1 jawdropper for me at Datastorm 2017. Awesome! Awesome FX + music in 1k ! Nice, how about a fileversion? page created in 0.016858 seconds with 15 queries.